The project? 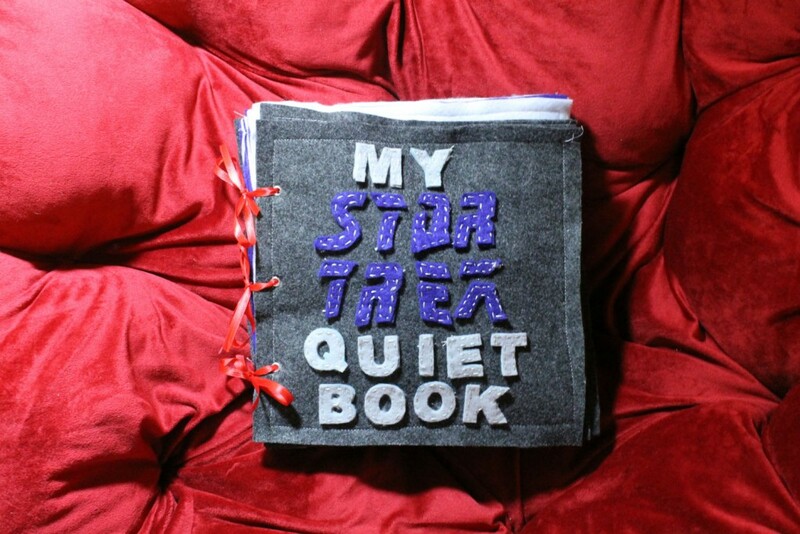 A Star Trek themed quiet book for my almost three-year-old niece. It’s almost entirely hand-sewed, with the exception of most of the pages being machine sewed together (in lines that aren’t straight! hooray!). 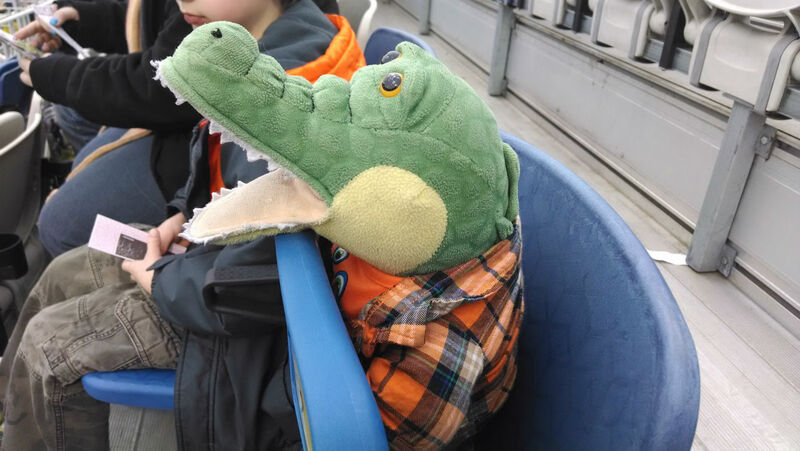 I bought the pattern here, after someone sent me a link to this blog awhile ago. My niece is finally old enough to be able to really play with a quiet book, so I thought Christmas would be a good time to finish it. I’m pretty proud of how it came out, considering that I’ve sewed nothing but a t-shirt blanket before. 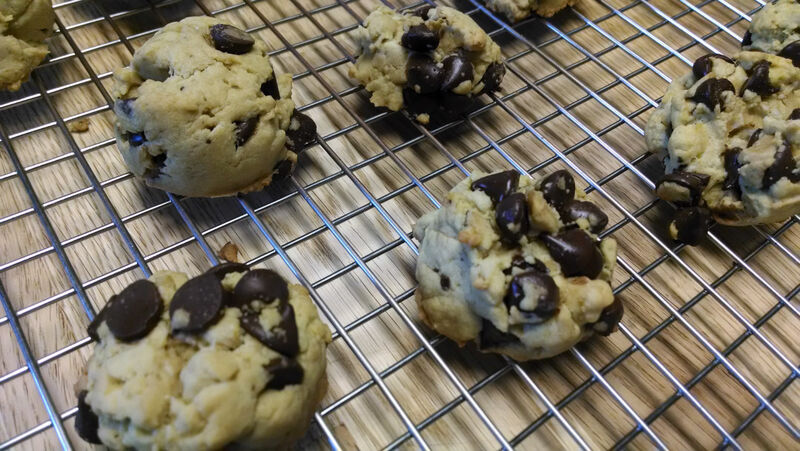 There are definitely things I’d do differently if I made a second one. 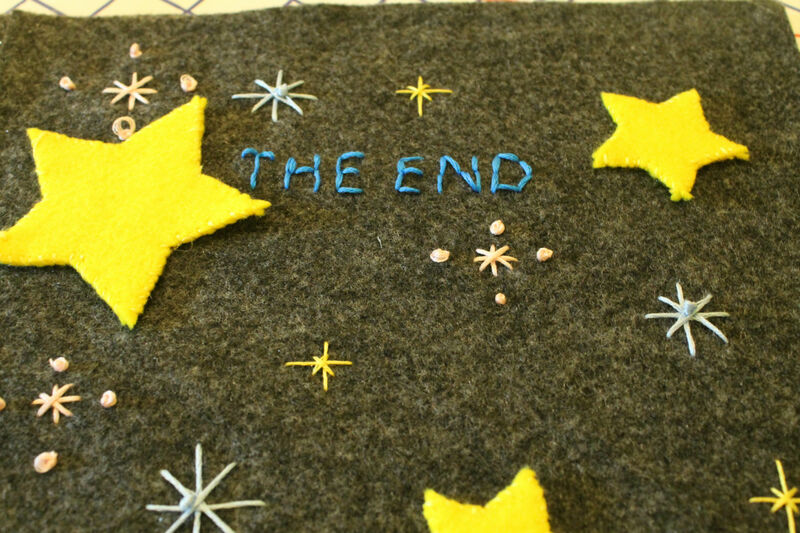 And I think I used the wrong needles on my sewing machine for felt, which led to having to hot glue the last couple pages together at the last minute. But all in all, I’m glad I was able to translate my love of Star Trek to this handmade gift. Here’s a look at the inside pages. The hole at the bottom of the hand is big enough to slip a tiny hand in. 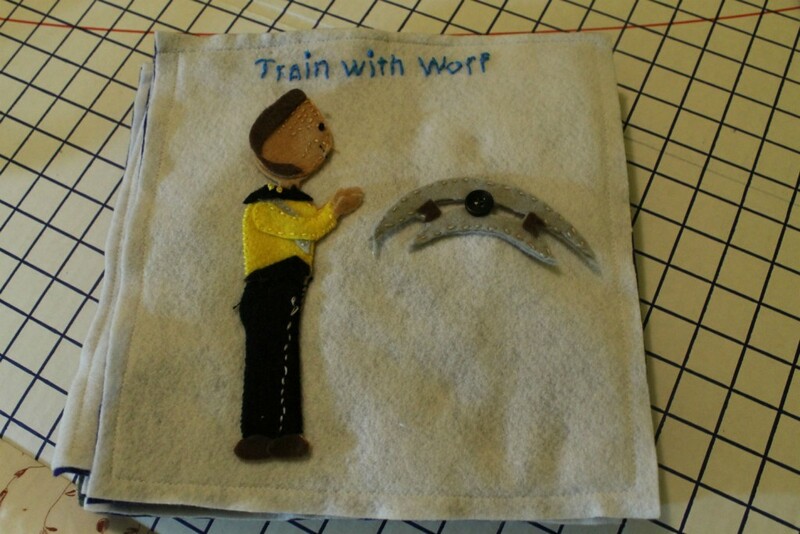 Worf’s bat’leth spins on the button. The saucer section stays on the page while the battle bridge separates on a snap that you can’t see in this photo. This page took forever, since each of the layers of the saucer are hand sewed together. 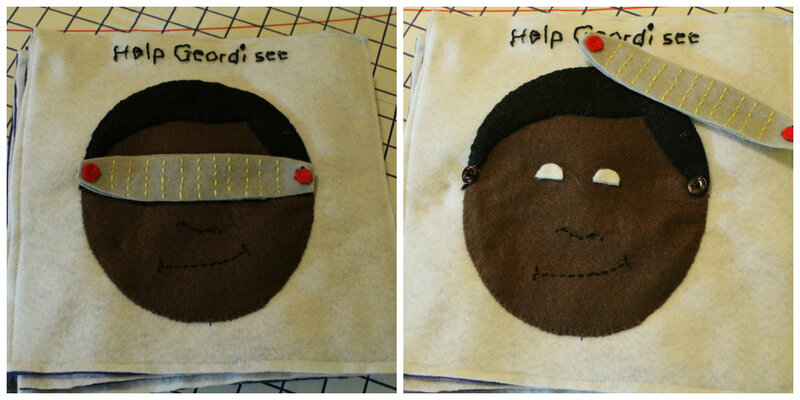 All Star Trek TNG fans recognize Geordi’s visor, though the order of these photos makes it seem like you help Geordi see by removing the visor. Which is not true. Without his visor, you see his foggy (creepy) white eyes. In any case, the visor attaches with snaps. 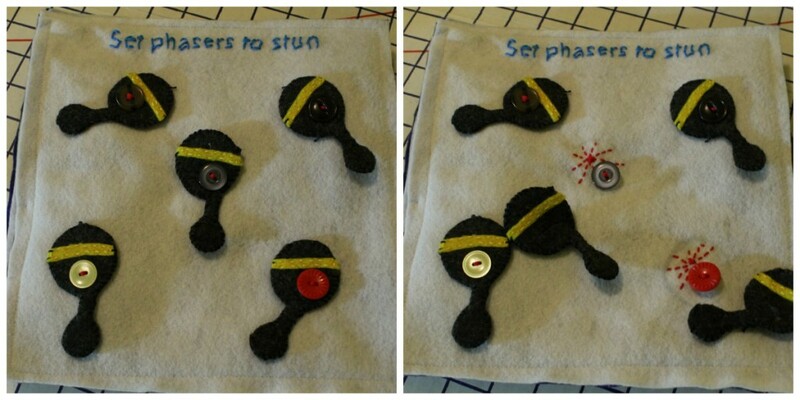 The original pattern uses “set phasers to kill” since these little gray things are floating probes to destroy. But this book is for a three-year-old, so I didn’t want to use ‘kill’ because that nuance is lost (that you aren’t hitting a human). So I changed it to ‘stun.’ When you remove the probe, you see the little explosion left behind. Each of these buttons are from my grandma’s button container (my niece’s great-grandma). I’m glad I was able to incorporate something of her in the book. 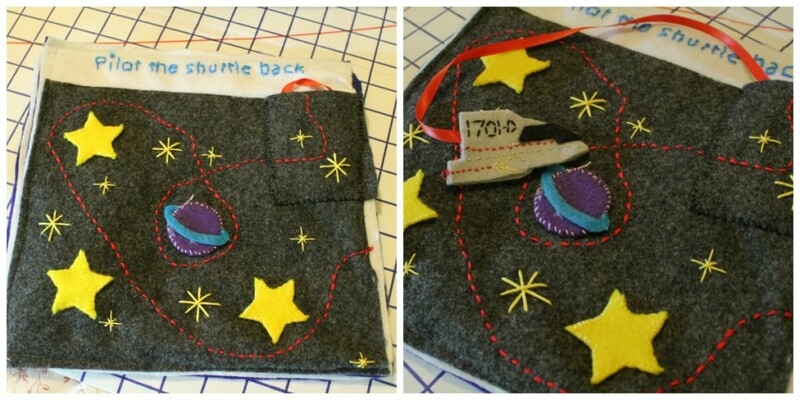 I love this page because it was fun to sew a path for the shuttle. Though it’s crooked as all get out, including the pocket. Straight lines are not my forte. Have I said that before? 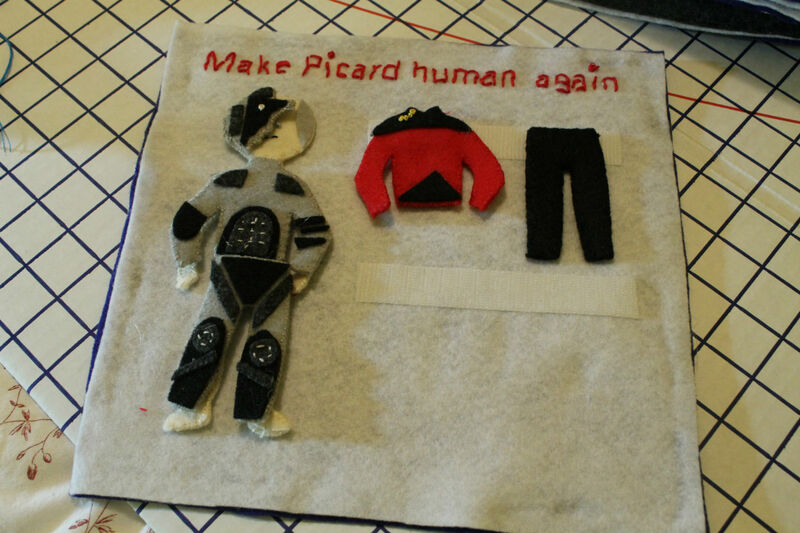 This page was also time consuming because of the tiny clothes all being hand sewed, as well as Picard’s body which is underneath his Locutus of Borg outfit in this photo. When you’re ready to de-Borgify him, you can put on his regular uniform (attached with velcro). I need a little break from sewing for a bit to catch up here and on some reading that I neglected in the last few weeks. But then I’ll be back at it again, working on my skills (and getting new machine needles!). 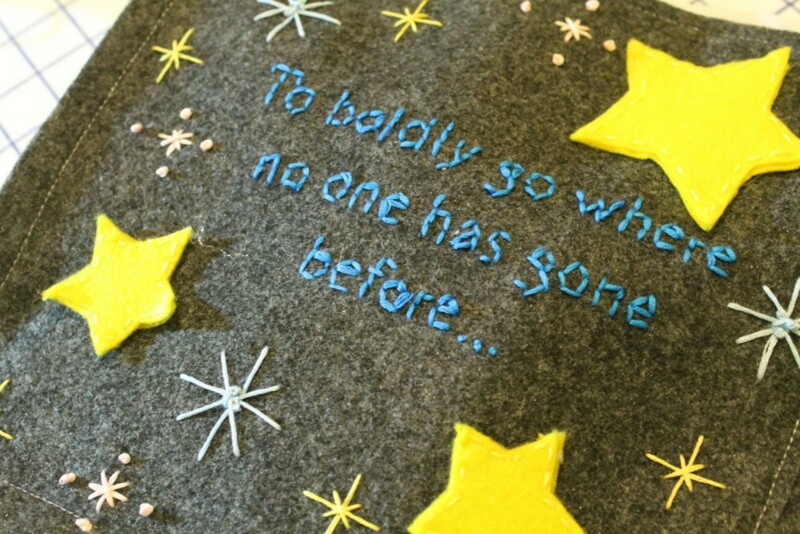 Going to do Mark’s t-shirt blanket next, but after that? No idea. 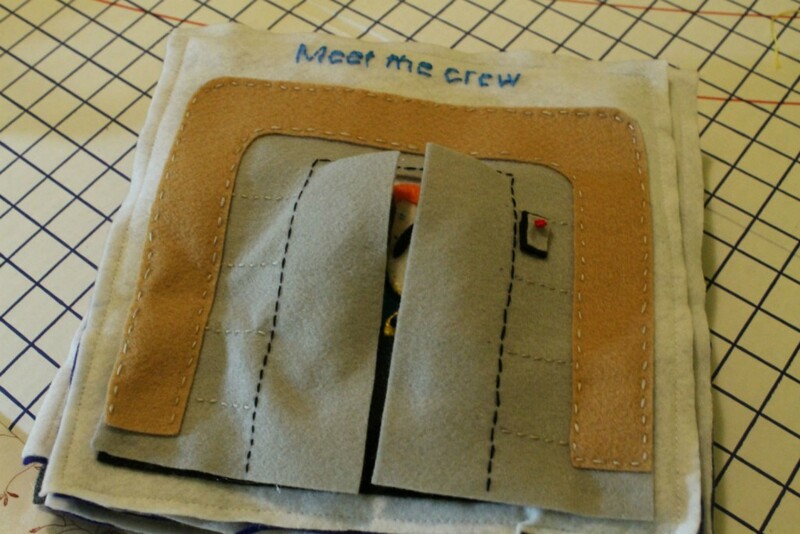 Definitely want to incorporate at least some sewing into my week though, since I found it to be really calming. I did it. After my initial hesitation with sewing, I jumped in on the t-shirt blanket project, in hopes that I’d be able to finish it by Christmas. I surpassed my expectations and had it finished by Thanksgiving! I laid them all out on a “flat” surface – the bed in our spare room (which doubles as my work surface). 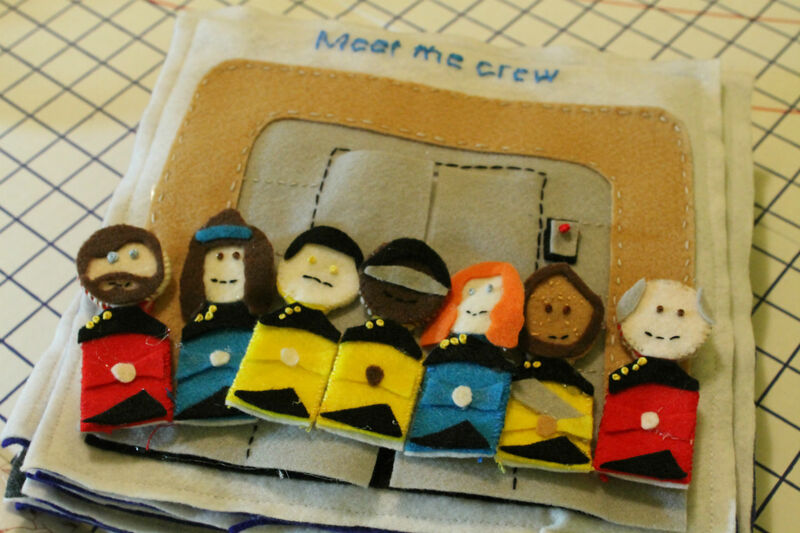 And started sewing them together, one at a time, putting the “good” sides together. 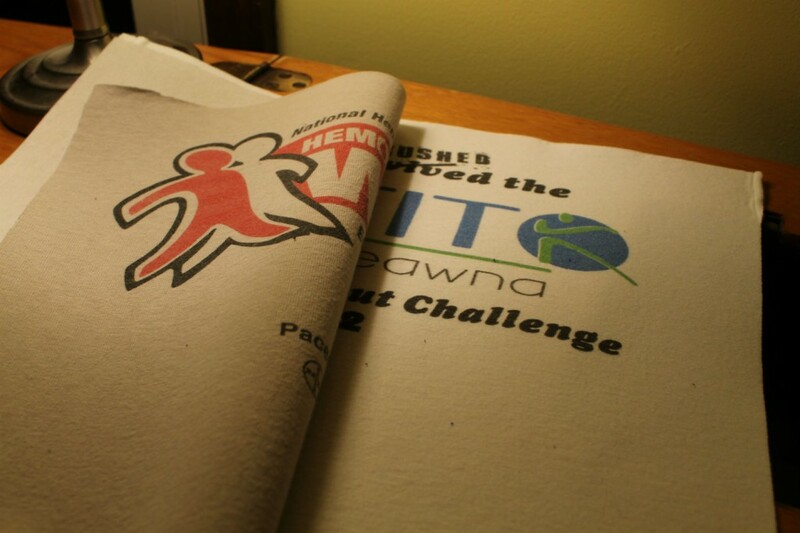 Once I had five rows of t-shirts, I sewed them together. Which was harder than it seemed, since the pieces started to get really large to pull through straight in the machine. I made use of a lot of my grandma’s quilting pins and stabbed myself not less than 400 times. But I somehow managed to get them together into a big block. Slightly crooked in places, but together nonetheless. For the backing, I used an extra flat sheet that we had on hand, which was the match to a fitted sheet that had holes in it. I’m so glad I kept it, because it ended up being a good one-piece back. Pinning the back on and sewing the blanket around the outside was the hardest part. A lot of exasperated groans trying to get the thing through the machine. Then it was time to tie the squares to the backing by using some yarn. I found some white yarn in my grandma’s desk, so I used that, as well as one of her needles that was called a “yarn darner.” Why? Because it said yarn and it seemed like it would poke through the layers. 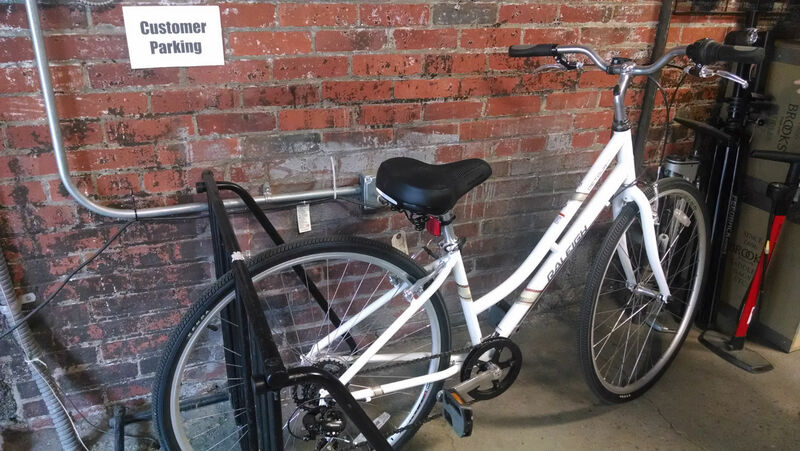 I’m a problem solver like that. So after what felt like a thousand ties, I had this. It’s hard to see all of the squares, since the blanket is slightly larger than this queen bed, but it looks nice from a distance! 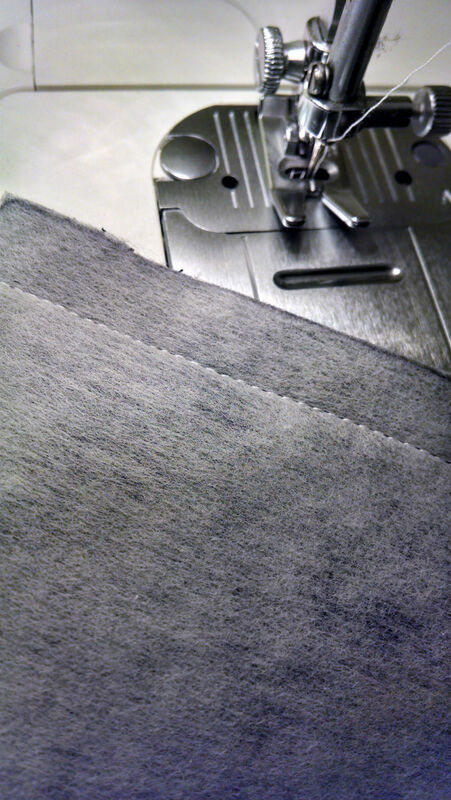 I washed it once to get the interfacing to loosen up a bit, and have been using it on the couch ever since. I love a lot of the t-shirts that are in the blanket for various reasons, but this one wins the prize for most ironic. 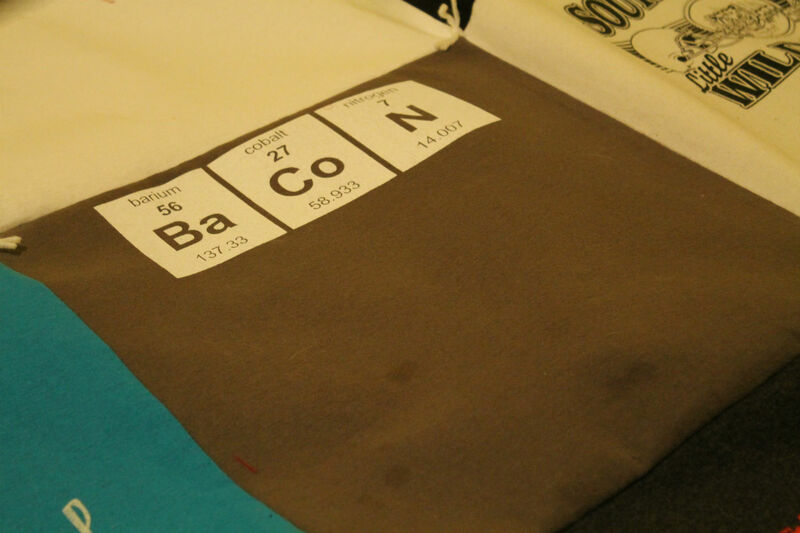 A bacon t-shirt from Think Geek’s random t-shirt bag – that I managed to get grease stains on. 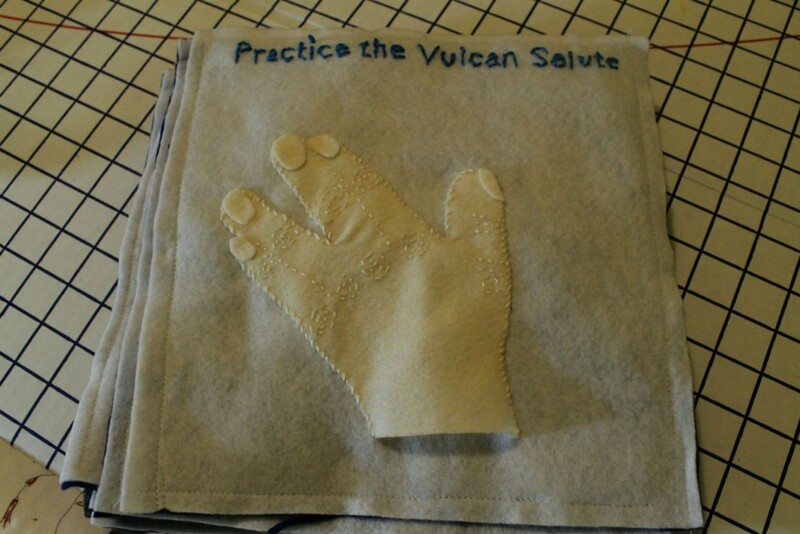 I felt like it had to go in the quilt with its grease stains because it was just too funny. 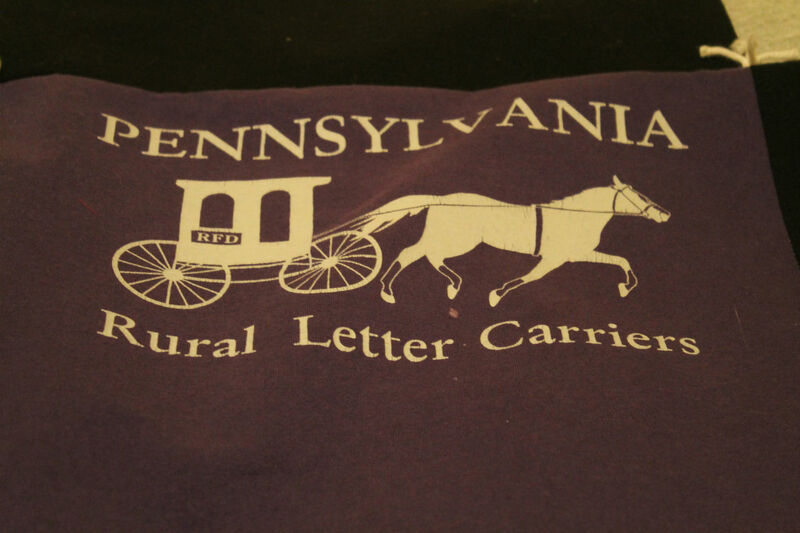 And then one of my favorite t-shirts in the blanket, the one that was my grandma’s. I somehow got this t-shirt of hers, and it had a hole in it, so I didn’t really wear it. Plus it was hard thinking about wearing it anyway. So I put it in the blanket – the first sewing project I made and the first with her machine (and her yarn!). 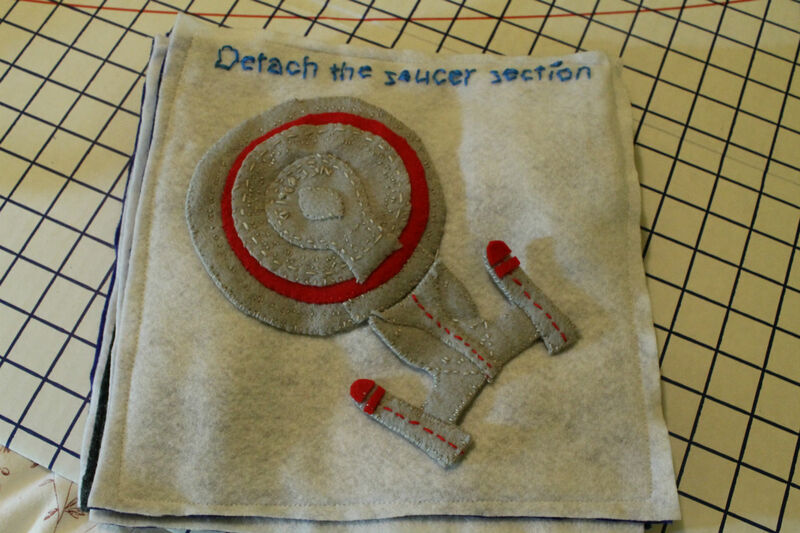 So now it’s on to make a second t-shirt blanket for Mark, who is the king of t-shirts. But first, I’m working on a secret project for Christmas, which I think will blow some socks off, but will also take every moment of free time I have from now until December 25. Good thing I already met my reading goal for the year! I had a free day this weekend. I haven’t had an entire free day to spend entirely as I choose in…well, I don’t even know. I couldn’t even settle on what I wanted to do with that day, but one thing kept nagging me – that I haven’t made any progress on my t-shirt blanket to fill my 2014 resolution. Why? Because the next step required the sewing machine. And I was scared of mine. I wasn’t scared in the sense that I would stab my finger with a needle like Sleeping Beauty. I was scared because I don’t know what I’m doing with it. But most of all? Because it was my grandma’s. 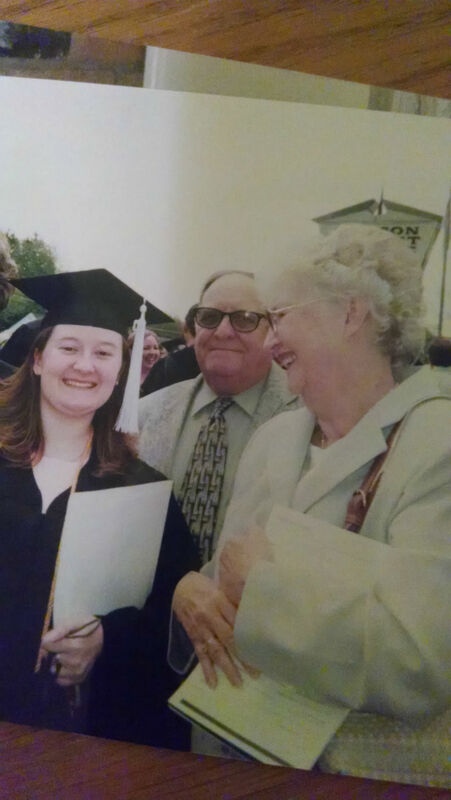 That’s my grandma at my college graduation in 2005 (and my grandpa too). I chose this one even though she’s not looking at the camera because the camera caught her looking at me how she always looked at her family. With total love and pride. With the tail end of a laugh. 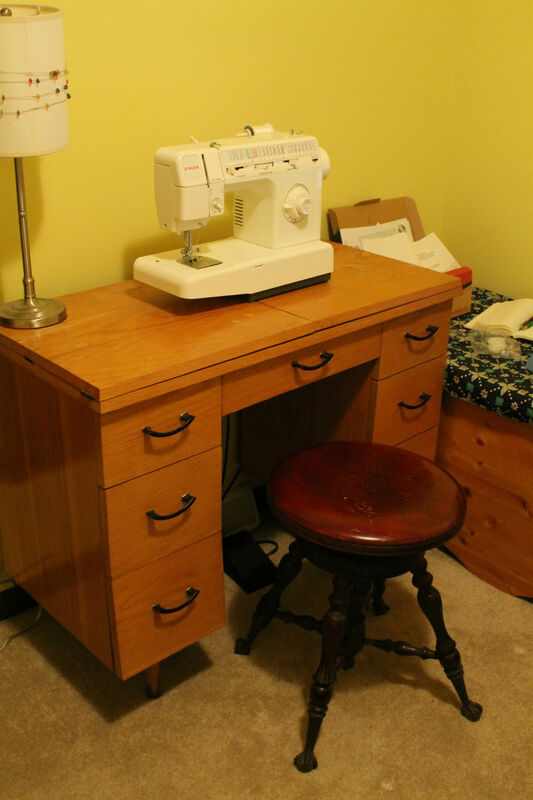 My grandpa gave me her sewing machine at least a year ago, as well as the sewing desk that he built for her and the stool she sat on to sew. The desk was built for her older model machine, where it would flip up from underneath. But it still works for this newer (1994) model, and gives me a leaf to fold out. I am the eldest of 17 grandchildren on that side of my family. We’re a brood, for sure. So I consider myself so blessed that he let me care for this machine that she was the master of. Grandma made all of the grandchildren blankets. I still have mine, even though some of the stitching that says ‘JoJo’ on it has faded in the 25+ years that I’ve had it. When she was done making blankets for grandchildren, I know she made many for Project Linus, which makes blankets for critically ill children. She probably sewed a million hems and fixed a million holes in her life, not to mention the many things she made. I know the Singer Model 5050 that sits on this desk now has seen use at her hands. So on my day of relaxation, I thought I should spend some time getting acquainted with the machine – perhaps filling a bobbin and threading the needle. I opened the needle plate and found a bobbin already there, with a small bit of white thread left on it. My heart jumped up in my throat. Because that was her bobbin, leftover from the last project that she sewed. And I suddenly felt that void again. It always happens around this time of year, even more so than in May, which is when she died in 2009. The holidays remind me so much of her, and the cold weather does too, because her house was always exceedingly hot, filled to the brim as it was with family. And pies. So in that moment of missing her, I started going through the drawers. The desk is solid wood, and because the drawers have been virtually unopened for years, they still smelled like her house. Like her. Like home and comfort and family. 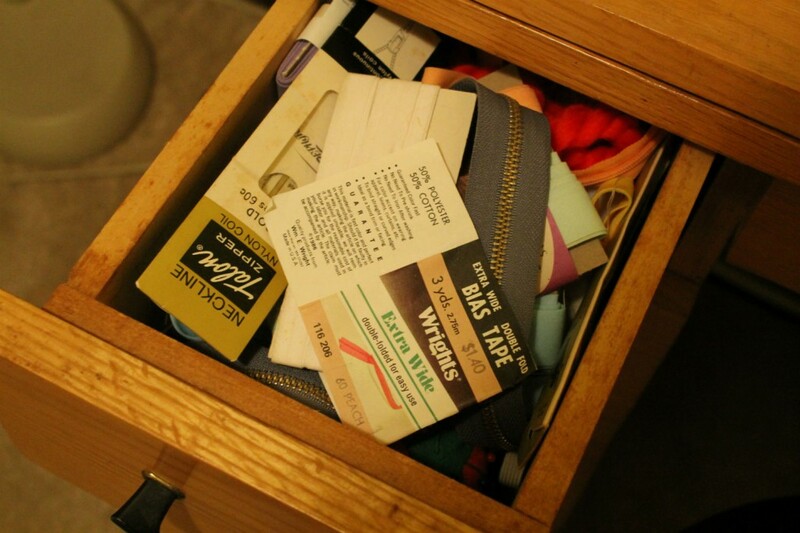 And I sat and cried as I went through the drawers and let the memories wash over me. 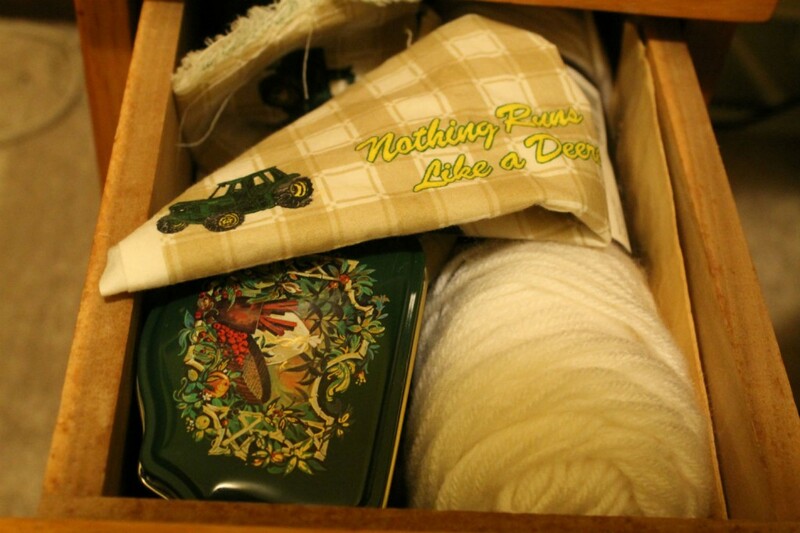 A scrap of John Deere fabric, because all Taylors love a good tractor. 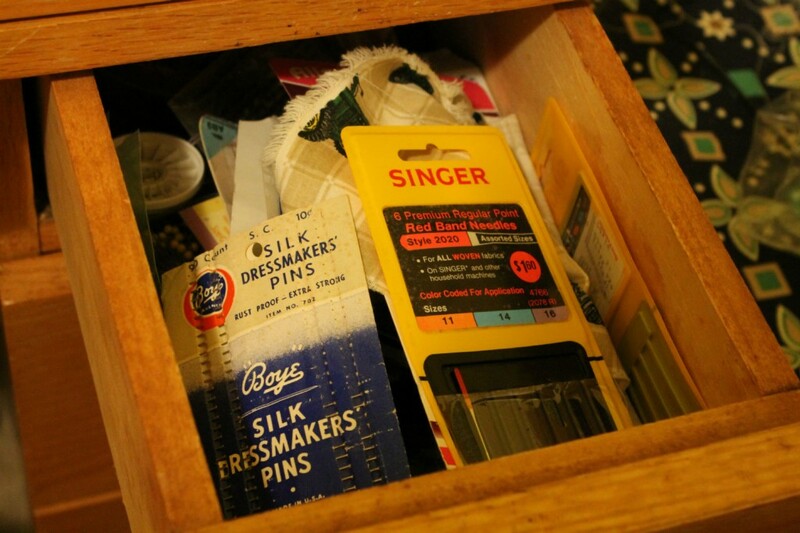 Some quilting things, I think. Some zippers and ribbon. I kept wanting to look through the drawers, but I’m hesitant to even open them, because the more times I do, the more they will smell like my house, not hers. That bit of her memory will be lost. After much sitting and thinking, knowing that she would say “golly Jo, there’s nothing to be afraid of. It’s just a sewing machine!” I sat down and got to work. I posted on Instagram about being overwhelmed by the newness of the machine and the missing of her in my life, and Jeni came to my rescue and suggested Craftsy’s beginning sewing machine tutorial. I watched it, I read the manual, and before I knew it, I had this. 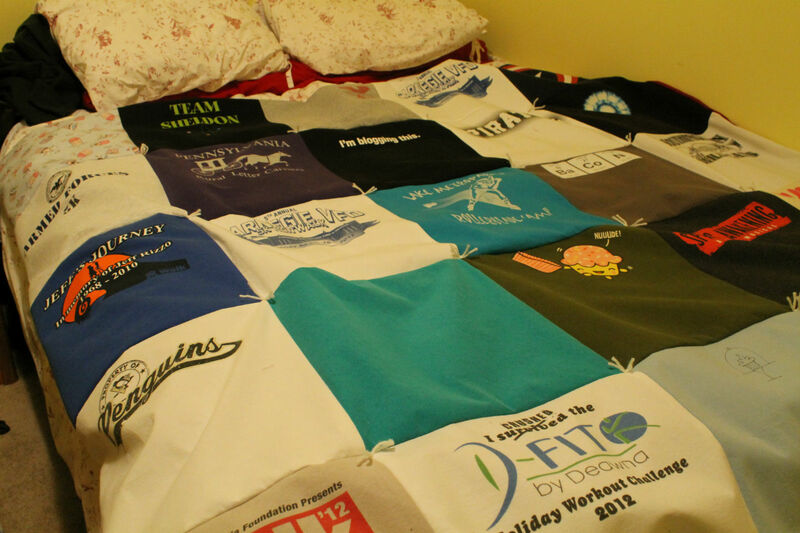 And by the end of the evening, five rows of t-shirt blanket, all connected. One of the t-shirts in my blanket belonged to her and I think it will be my favorite part. Might have to work in a piece of that John Deere fabric, too. That way, part of her last project will be part of my first.